This trip can be customized to your travel schedule. The best time to travel is January-February. Please inquire. A trip inspired by dance, drama, sacred cave art, temple devotion, family traditions, and the source of flavor: spice! On this trip, you’ll visit some of the classic must sees – the famous rock temples of Mahabalipuram, the architectural wonders of Madurai said to almost rival the Taj Mahal, the sacred frescoed Buddhist and Hindu caves of Ajanta and Ellora, and the classical dance, music and arts of Kochi and Chennai. Alleppey and Thekkady add untold treats to your travels: floating down the quiet waterways of Kerala’s backwaters, where life passes at the pace of a floating leaf; spending time with a homestay family at riverside; and tracking wildlife at Periyar Wildlife Sanctuary. Your itinerary has been planned to give you a taste of South India’s ancient cultures and arts at a relaxing pace that allows you to discover some of your own treasures in this rich tapestry of life. Trip dates can be customized to your schedule. The best times to travel are during the cooler months of January and February. It is pleasant from November through early March. January hosts a colorful Tamil festival called Pongol. Join the fun! 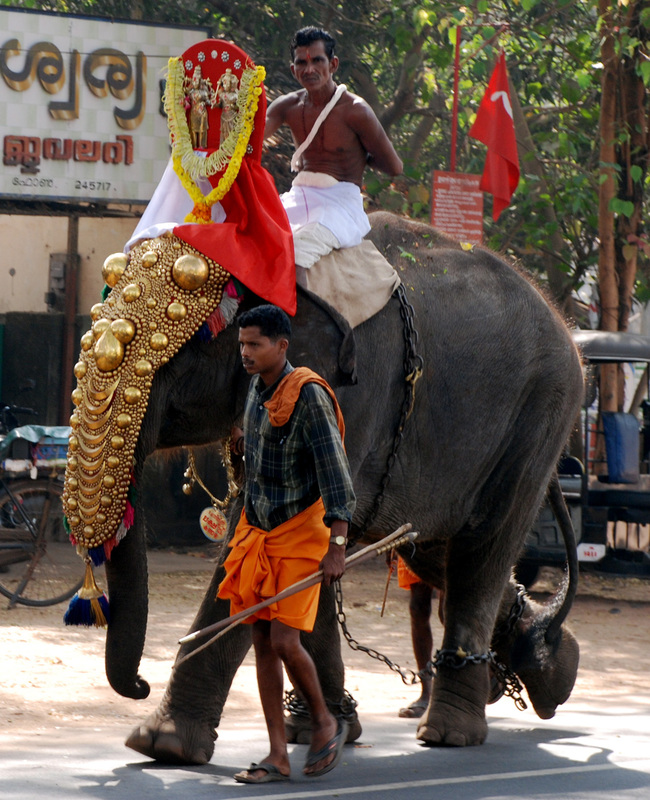 Read more about South India and what makes it so special! Day 1: Arrive in Mumbai: On arrival transfer to your hotel and overnight in Mumbai. 4-5 star option: What better location than the Taj Mahal Palace, overlooking the Gateway of India monument and the Arabian Sea. Other hotel choices: We offer a choice of hotel standards on this trip. Please contact us for details and trip prices based upon 3-4 star or 4-5 star and boutique hotel choices. Day 3 & 4: Ellora and Ajanta Caves: Fly to Aurangabad for a two day visit to these world class caves. Sculpted into sandstone cliffs, the breathtaking Ellora caves contain stunning bas relief, statues and images of Buddha and Hindu deities. 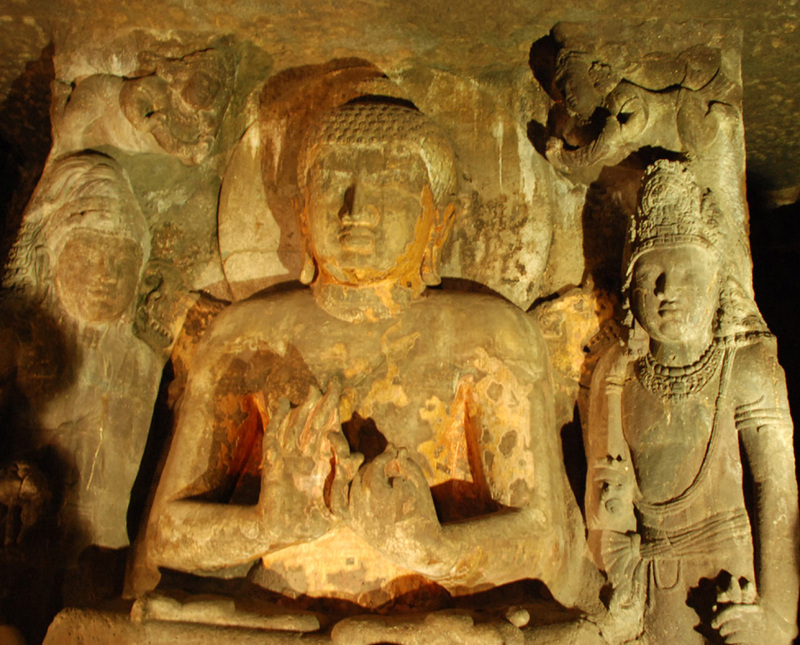 The magnificent Ajanta caves depict the life of Buddha in mammoth stone grandeur, dating from 200 B.C. Overnight in Aurangabad. Day 5: Aurangabad-Mumbai-Cochin/Kochi: Fly to Mumbai and on to Kochi. Set on a promontory on South India’s Arabian Sea coast, Kochi was a trading port since Roman times, and thrived from early trade between Europe and China. Today it is an active harbor yet retains its colorful Portuguese architecture and a relaxed seaside ambiance. Visit the lively Kathakali dance presentation and go back stage to see dancers preparing. Overnight in Kochi. 4-5 star/boutique option: Choose from a number of historic boutique hotels in the charming old town neighborhood of Kochi. Day 6: Kochi: Today you’ll have a full day of sightseeing taking in the city’s highlights including Fort Kochi – giving title to the historic town - Mattancherry Palace built in 1557 as a gift to the Raja, and the Jewish synagogue, the oldest in the Common-wealth world. Snap a photo of the picturesque Chinese fishing nets at dawn or sunset. Overnight in Kochi. Day 7: Kochi-Alleppey, Houseboat on Lake Vembanad: Drive to Alleppey and board a traditional houseboat known as a kettuvallam or rice boat, for a glide through back-waters and picturesque farmlands. 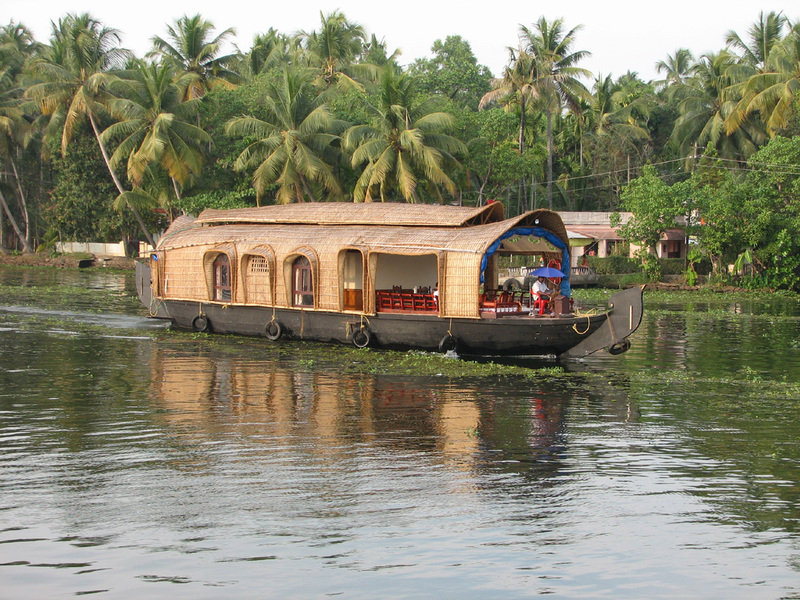 Built of local materials such as bamboo and coconut, these vessels have been re-furbished as houseboats with comfortable sleeping quarters, attached bath, and a private balcony; a cook will prepare authentic Kerala cuisine. Overnight on the houseboat. 4-5 star option: A private houseboat experience. Day 8 & 9: Village Homestay: Spend two nights in a village homestay, exploring the local environment on foot, bike or boat. Families are very accommodating and enjoy sharing cultural insights - even family recipes -- with guests. You'll have a private room and plenty of privacy to sit back and enjoy the slow pace of village canal-side life. Overnight at the homestay. Day 10: Thekkady: Drive into the cool lush hills to lakeside Thekkady, bordering the Periyar Wildlife Sanctuary and Tiger Reserve. The afternoon is free for exploring on your own. 4-5 star option: The Spice Village Resort is our choice of deluxe accommodations with ayurveda massages, yoga and naturalist guided jungle walks and boat ride. Overnight in Thekkady. Day 11: Thekkady and Periyar Wildlife Sanctuary: A day for gentle nature walks and a boat ride on Lake Periyar. 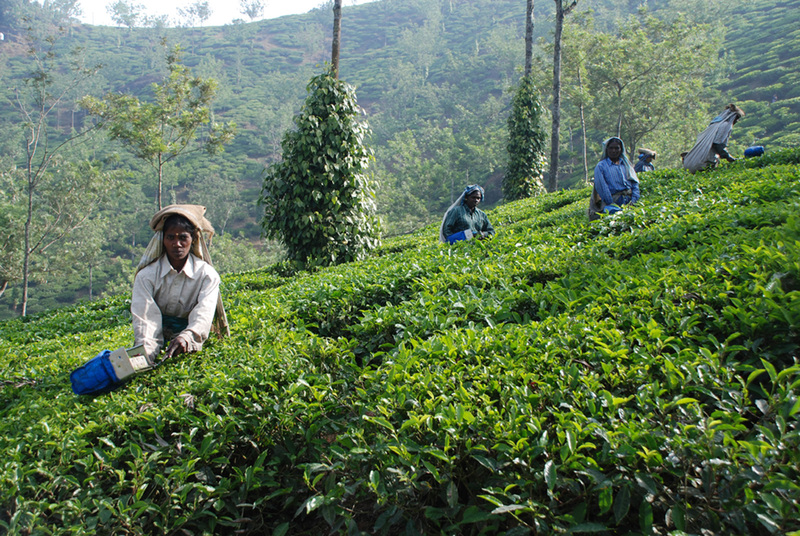 Tour nearby plantations of cardamom, pepper, and other highland spices. Overnight in Thekkady. Day 12: Madurai: Drive through picturesque hill country to Madurai, the Athens of the East and the cradle of Tamil culture dating back more than 2,500 years. Visit the city’s famous Tirumalai Nayak Mahal, built in 1636 in the Indo-Mughal style with numerous domes, arches and ornate stucco work; and in the evening, the Sri Meenakshi Sundareswar Temple – contemporary with the Taj Mahal in Agra, with 4,000 granite sculptures, imposing towers, and the “Tank of the Golden Lotus”. Overnight in Madurai. Day 13: Madurai-Chennai and drive to Mahabalipuram: Fly to Chennai and drive a short distance to Mahabalipuram, visiting an outdoor village museum and heritage center where artisans work and sell their wares. Overnight at a beach resort in Mahabalipuram. Day 14: Mahabalipuram: Wake up to the sounds of ocean waves from the Bay of Bengal. Tour Mahabalipuram, famous for its 7th and 8th century rock temples and noteworthy bas relief built on a rocky outcropping along the shore – a UNESCO World Heritage Site. Overnight in Mahabalipuram. Day 15: Mahabalipuram-Chennai (via Kanchipuram): Drive to Chennai via Kanchipuram, an ancient city of a thousand temples and one of the seven most scared Hindu sites in India. See exquisite silk saris and cloths being made from mulberry silk in Kanchipuram, then drive to Chennai. Overnight in Chennaia. Day 16: Chennai: Site of the first British settlement of the British East India Company – and previously known as Madras- today it is the capital of Tamil Nadu State. Visit the legendary forts and churches built by the British, a 16th century Shiva temple, and an international center of classical dance music and fine arts. Explore local markets and neighborhoods on your own. Overnight in Chennai. Day 17: Depart Chennai Transfer to the international airport for your flight onward or home. Trip Cost: Trip cost will vary based upon the selection of hotel accommodations: choose from 3-4 star or 4-5 star/boutique hotels and guest houses. Please contact us for a quotation.